New York, the city that never sleeps…but also a city renowned with big money! But that needn’t be the case. As self confessed budget travellers and having visited for the first time as a student we can safely say that with a bit of thought NYC can easily be an affordable trip for anyone’s budget! Here is a run down of our tips for cost cutting in the worlds most amazing city! Here’s how to do New York on a budget and still have an amazing time! 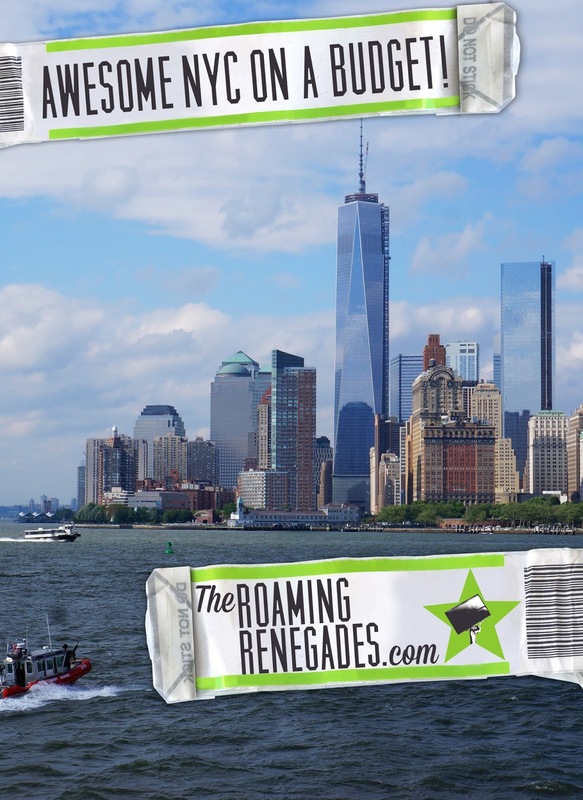 So, you might know that the Roaming Renegades and New York have history! It’s pretty much our favourite place in the world, we just love the buzz, the energy and the endless amount of amazing things there are to see and do! It would be impossible to list them all, and well, part of the fun is discovering them for yourselves! But the city in which we decided to get married is a special one and for that reason we love to spread the word about how accessible it is for everyone to experience! Flying to New York from Europe can be cheap if you look out for deals and travel outside of the peak months. We have paid as little as £330 each for a flight in February! If you happen to be a little closer by then travelling across America is not at all expensive. For example we took the Greyhound to both Washington DC and Boston whilst visiting New York and it cost us $15 each way! For UK Citizens getting to the USA is easy, you technically don’t require a visa but you do need an ESTA which can be done online and should be done before you travel so you should Apply for your ESTA now! New York is renowned for its amazing subway system which covers all 5 boroughs over miles and miles of track. Unlike the underground in London the New York subway doesn’t have zones. This means for one flat rate you can travel anywhere…it’s also open 24/7! It’s not something to be scared of either, its fast, safe, cheap and your key to anywhere in the city. Good for unlimited subway and local bus rides until midnight, 7 days from day of first use. This can be the deal breaker when it comes to NYC. A good piece of advice would be to start looking and book early, also choose your area wisely. Staying in Midtown or around Times Square will cost you a huge chunk. We love the area around the outskirts of Chelsea in the vicinity of Penn station/ Madison Square as it is within walking distance of Times Square, close by to a well connected train station and subway as well as being in an area with great budget food options within a walkable distance. There are also some good hostels and small hotels in this area. 5 star Hilton for our wedding! If you are after a really great deal then you could even try over in Brooklyn or Queens. As long as you are close by to a subway station then you are close to anywhere! Again…the key here is to stay as far away from Times Square as you can! If you eat in chains, Downtown/ Midtown you will pay a fortune! Now it depends how much you want to save but you can eat for hardly anything in NYC if you want too! The first time I visited I was a poor student, I was literally scraping the barrel of funds, but I never went hungry! Some of the best dishes in New York City are actually some of the least expensive ones! On almost any street corner there are signs offering $1 pizza slices…this isn’t a scam and they are tasty as hell, as well as being bigger than my head! A couple of these would fill me up, or buy a whole pizza bigger than you could ever imagine for under $10! Then there are street carts: The halal guys for example have queues around the block for cheap and tasty food. Not forgetting Gray’s papaya either: You can get two hotdogs and a drink for a few dollars! So, you can survive just fine for a week on hotdogs and pizza but New York has so much more to offer! Don’t worry, there are many great places to eat for a good price. Just make sure to, once again, avoid the most popular areas such as Times Square, Mid-town, Down-town etc and explore a little further. Have a look around Chelsea, SoHo, TriBeCa, The Meat Packing District, The Upper East side, 9th Ave and also try out some of the smaller diners. If you feel like venturing further a-field once you get out of Manhattan the price will drop rapidly again and there are some amazing places in Brooklyn and Queens! My brother and a frankly ridiculous pizza! A legendary FREE service which connects Manhattan to the borough of Staten Island. Often used my commuting locals this short trip allows amazing views of downtown NYC and Liberty Island for absolutely nothing! Add to this the unique atmosphere and local vibe of this ferry it one of the best things you can do in New York for Free. In Manhattan, J/Z to Broad Street; 1 to South Ferry; 4/5 to Bowling Green. In Staten Island, Staten Island Railway to St. George. Sure, Manhattan has a lot to offer and is pretty amazing but many people forget just how big New York City actually is. It consists of 5 borough each of which have their own unique characters and charms, and contrary to what you might think they are no longer danger zones! Not only will you find the general cost of pretty much everything to be cheaper but there are a ton of interesting things to discover. Just take the subway and explore…the city is your oyster! What about heading to the beach and amusement park down in Brooklyn, the Zoo in the Bronx, or catching a baseball game in Queens! The possibilities are endless…and cheap too! New York is full of amazing galleries and museums, of course, many of these have entrance fees, but there is a long standing tradition in this city of making art and culture available to all. From amazing student entrance prices on almost every establishment to the “Free Museum Days” each place holds each week. There are also a number of museums and galleries which are also either always free or have a “Pay what you want” policy. Do some research beforehand and plan your days out to make the most of these offers. Of course, when you come to New York there are certain things you are going to want to make sure and do whatever budget you are on! But, there is a great couple of ways you can cut costs on those New York tourist must sees! The New York and New York Explorer passes allow you to choose a number of attractions and pay for them before hand and a reduced rate. They are also quite flexible with different price systems and number of attractions available. I always say with things like this that it is the most valuable if it covers things you would have done anyway. Do a bit of research and work out which will cover the most and at the cheapest rate, if you find one that fits well with your plan then the chances are you will save big! One of the best things about New York is that for the majority of visitors, especially from the UK or Europe, our currency is worth so much more in the US! This means that even with the sometimes inflated New York prices pretty much everything on offer is almost half as cheap as it would be at home! This is a perfect opportunity to get a new camera (as I did!! ), some designer clothing or expensive outdoor and travel gear for a great price! If you want to save even more then as always head further out of the busy areas and out into the other boroughs too! Taking a walking tour is a great way to see a city through new eyes, whether that be searching out a hidden history or finding out all those memorable filming locations New York is famous for. We love exploring the city on foot ourselves and getting lost but at the same time having a guide who knows the area inside out is a fantastic way to get beneath the surface of the city. New York is full of parks and pretty much all of them are free! From the obvious choice of Central Park with the boating lake, Strawberry fields, The stunning Bethesda fountain and Bow Bridge…not to mention a whole host of other free and paid for features and activities! Then there are smaller parks such as Bryant Park and Washington Square Gardens where you will be sure to catch a free show by local performers and even some free festivals in the summer. Or head to The Highline in Chelsea, a converted old highline railway with many original features along the line still in existence. There are also many local neighbourhood parks all over the outer boroughs too including The Jamaica Bay wildlife reserve which feels a million miles away from the inner city! Another amazing New York experience for completely free! Nothing quite compares to the view you get walking what is just over a mile across this iconic bridge. The view of downtown Manhattan is unrivalled and seeing the almost 150 year old bridge up close was a real memorable moment for us. Starting over in Brooklyn and walking back towards Manhattan means amazing views the entire journey! Brooklyn: High Street, Borough Hall. 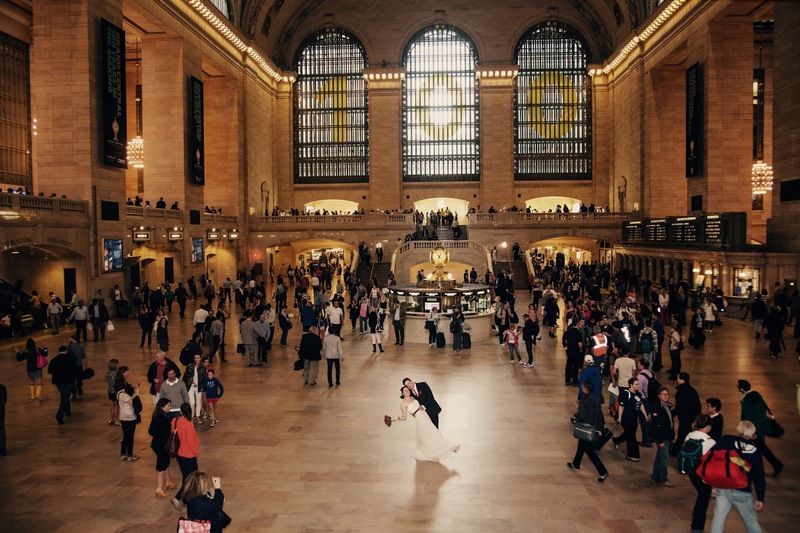 This iconic train station terminal is again free to enter and explore. Built back in 1871 this historic monument is a must, the stunning main hall has featured in numerous films, photographs and television programs and is an impressive sight. The decorated astronomical ceiling, detailed carvings, marble flooring and the four faced brass clock on top of the information booth make this an extra special train station. Yet another amazing free building to visit in this amazing city, once that once again is full of history, culture and stunning detail. Established in 1895 the most iconic area of the library is the Rose Main reading room which feels like it could be in a European palace it is that grandiose! Painted ceilings, huge chandeliers and huge lead lined windows – what an impressive place to study! Did you know you could kayak down the Hudson? Not only that, but for free too!! What better adventure than to see the city from its iconic river? This alternative expedition is one that not many know about but will surely impress and intrigue your freinds and family! Only…I’m not quite sure I would want to fall into that water but hey, live on the edge a little!! The public boat houses such as the Downtown Boathouse and Long Island Community Boathouse in Queen offer free rentals. There is nothing quite as American as going to a ball game and despite what you might imagine it is easy to get tickets and also great for the budget. I am a huge fan of the Mets so of course I am a little bias here but if you fancy a second class show there is also some team called the Yankees too up in the Bronx! (lol). But a day at the baseball is more than just watching the game, but a complete American experience! Whether out in Queens or over in the Bronx tickets start at around $20 and given that there are 162 regular season games often a few nights in a row you are pretty much guaranteed a ticket! You might have imagined this would be missing from a list of budget tips for New York but taking the ferry over to Lady Liberty isn’t at all expensive. Of course, you can see the iconic statue for free from the Staten Island ferry but nothing quite beats getting up close and personal with this 129 year old beauty! For only $18 you can see both the Statue of Liberty and the gateway for millions of immigrants into the U.S, Ellis Island. Plus of course a lovely ferry ride! So there you have it, lots of budget tips to make your trip to New York one which doesn’t need to break the bank! And this isn’t even everything, there’s so much more to do in this amazing city for very little money or even free. Part of the fun is discovering some of them for yourselves! Do you have any budget tips for New York? Bookmark this article How to do New York on a budget and still have an amazing time! Excellent stuff 😉 We are wrapping up a 10 day house sit by Central Park West – where NOTHING is cheap LOL – but did do some budget stuff to avoid breaking the bank. You can eat cheap, find good lodging that costs not too too much and hey, a day walking around Central Park is fun, and free as can be. Thanks Ryan, I bet that was a fun place to stay, but yes, that isn’t the cheapest area of the city at all!! Lots of places where you can find great budget food and activities though! Brilliant guide. So glad to know New York is doable on the cheap! The biggest cost we have is usually the airfares, coming from the Pacific region. But New York has been on my bucket list forever! Yes, for sure the flight and accomodation are the most expensive parts, for us from the UK the flight isn’t too bad! Thank you! Yes we still want to go back and see other things there and also there are things that you can just do over and over and never get bored of it! That is a great website, thanks for the suggestion!